At sunrise on [July] 30 the command crossed at Point of Rocks [on the Appomattox River], and, marching past General Meade’s headquarters, arrived at Lee’s Mills, on the Blackwater, at 3 p. m., the Tenth [New York Cavalry] in advance. Lieutenant Hinckley, of Company C, attacked the enemy at the bridge, and in a few moments the entire Regiment was engaged. The First Massachusetts Cavalry got on the enemy’s flank, while the Second Pennsylvania [Cavalry], the 6th Ohio [Cavalry], and [the] Tenth [New York Cavalry] charged dismounted, capturing the bridge and taking some prisoners. After repairing the bridge the First New Jersey [Cavalry] charged across, mounted, and took more prisoners. In the morning [of July 30, 1864] the famous mine was exploded, the assault [i.e. the Battle of the Crater], so well designed and admirably masked, failed, and the whole series of manoeuvres had therefore resulted in nothing but unavailing fatigue and bloodshed. The Second Division, however, was not yet allowed a rest. 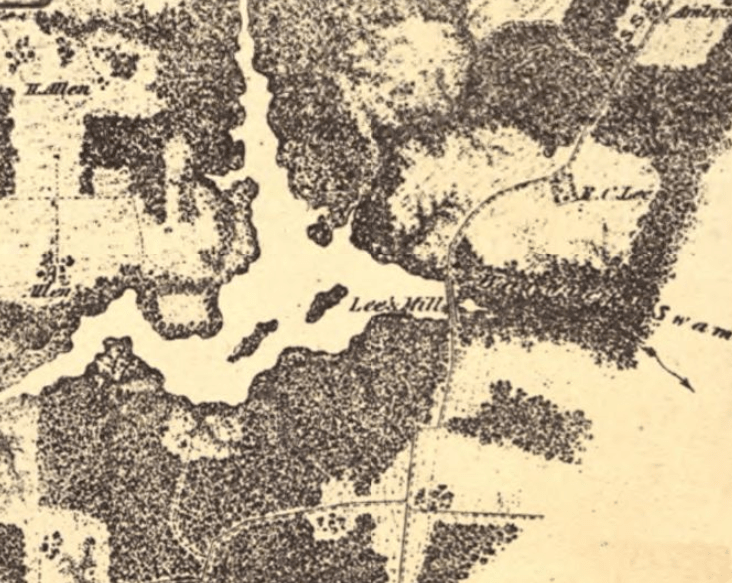 It was pushed on to its old ground at Lee’s Mills, where the rebels during our absence, had established a picket post. The narrow bridge across the mill-dam had been destroyed by the enemy, who thus had secure a strong position. Through the swampy ground below, however, a dismounted force of the First Massachusetts [Cavalry], with the third battalion of the [First New] Jersey [Cavalry], pushed along around the rebel right flank, while the Tenth New York [Cavalry] skirmished in their front. Under cover of the artillery the Second Pennsylvania [Cavalry] prepared to charge across the mill-dam, while the First New Jersey [Cavalry] mounted was ready to charge as soon as plank could be laid upon the bridge. The fire of the [Tenth] New York men passing over the heads of the enemy, forced our men who had gotten in their rear to be very cautious; but at length, simultaneously, the Pennsylvanians charged in front, and the Massachusetts with our third battalion on the flank of the enemy, forcing them to run at full speed into the woods, abandoning their blankets and provisions. As those of them who had reached their horses started off at full speed, the [First New] Jersey [Cavalry] came upon them driving over the bridge and dashed after them at a charge. The movement was splendidly executed, but the rebels did not wait for its performance. As the regiment went over and through their barricades, the horses breasting the fence-rails and crashing among the trees, the enemy was seen in full gallop beyond them. After a tremendous race in which a few prisoners were captured, the regiment returned, and the ground was held by an improved line of pickets. The brigade, changing from one dusty camp to another, was able to get some sleep at night but very little rest during the day, the duty being heavy upon so small a force. Thanks to Bryce Suderow, I was also alerted to the existence of Saddle Soldiers: The Civil War Correspondence of General William Stokes of the 4th South Carolina Cavalry, which contains a good account of the fight. Unfortunately, I have not yet received the book, and so am unable to post the Southern perspective of this little skirmish for now. To the men who were killed and wounded here, though, this fight was every bit as major as the infinitely more famous Battle of the Crater. 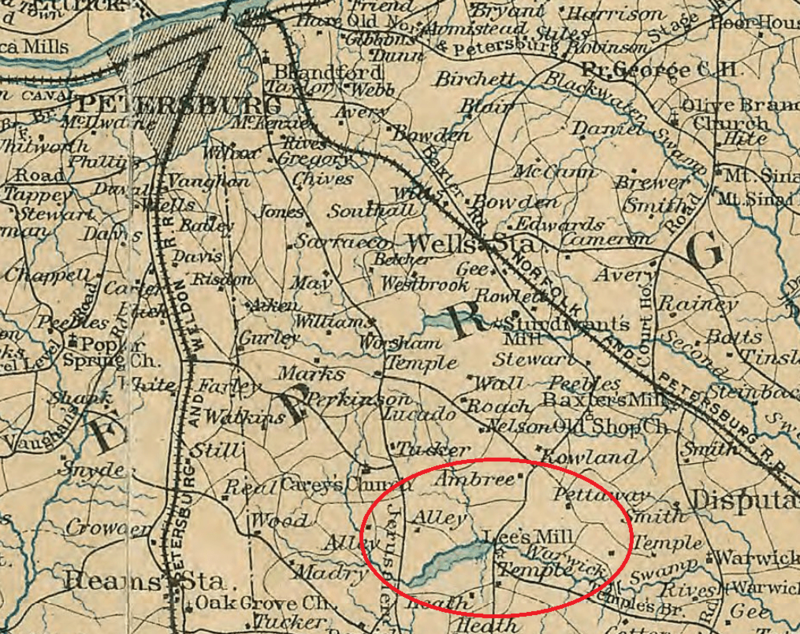 If you have any other leads as to where I can find even more information on the July 30, 1864 Skirmish at Lee’s Mill, please use the comments section below and point me in the right direction. Thanks! I have a great-great-grandfather who was in the 6th South Carolina Cavalry captured here, so I was looking for more information on this. He was sent to Elmira but was paroled in March 1865.